I’m writing this blog post not because I believe newborns can or should be on a schedule, but because I know this is a question frequently asked by new parents. First, let’s define two terms – newborn and schedule. Newborns are babies aged birth–16 weeks, counting from their due date. If you give birth 4 weeks early, your baby remains in the “newborn” stage until they are 20 weeks of age chronologically. Schedule, when used in relation to infant and toddler sleep, refers simply to naps and bedtime happening at more or less the same times each day, with an emphasis on sleep lengths for nap and overnight sleep lasting for more or less the same durations each day. For many reasons, newborns are not biologically capable of having a “schedule” in the traditional sense of the word. While many resources online encourage the scheduling of newborns, it is generally unwise to try to mandate or even expect a super predictable pattern in newborn sleep. Newborns do not have regular outputs of the hormone (melatonin) that regulates their sleep patterns. Therefore, you may find them physically incapable of sleeping at some times, while you may then also find it next to impossible to wake them at other times. While there are some easy going newborns who adapt well to sleeping at the same times each day, most new babies are not capable of having wholly predictable sleep patterns. Also, know that while your newborn can’t yet be on a schedule, there is a tremendous amount you can do to encourage lengthy periods of sleep overnight and good sleep habits during the day. For those sweet mothers who are like me (type A, anyone? ), I will not leave you without something to work with when it comes to your newborn’s daytime sleep “schedule.” First, try to remember that your goal should be a pattern or cycle, and not a schedule. A good tip is to try to start your day at the same time each day. If you have to get out of bed each morning at 7 am to get an older child to school, get your newborn up as well, expose them to sunlight, and give them a good feeding while trying very hard to keep them alert and awake throughout the whole feed. Then, watch them closely to see when they may be starting to feel sleepy. This can happen within 30 minutes or 90 minutes, depending on the baby, their age, and whatever their melatonin output from their brain happens to be doing on that particular day (note: their varying wake time lengths from day to day is what makes it impossible to schedule them – they may want or need to be awake for different lengths throughout the day and it can vary widely from day to day and change with each week they grow older). If this is your first baby and you can sleep in, fantastic! But, still aim to get up and start your baby’s day within 30 minutes of the same time each morning (whether that’s 7 am or 10 am). Once baby shows a tired sign, put them down for a nap. Their nap may last 25 minutes, or up to two hours (wake them at the 2 hour mark, and also note the varying length in nap, which is NORMAL, is another reason it’s impossible to “schedule” a newborn), and then restart the “eat, wake, sleep” cycle. Continue this pattern throughout the day and aim for “bedtime” to be about 12 hours after you got them up to start the day. Finally, for the 12 hour “overnight” period, aim to keep lights low and also do not have any wake time after feedings – simply feed in as little light as possible, then put baby down again right away, and repeat until your morning start time. Some days you may have more naps than others, and some days you may have some long naps and some short naps, and that’s all normal and okay. Try to start your day at the same time. Put baby down for a nap when they show their first tired sign. Keep lights low at bedtime and during night feedings. I also have one more thing for you – My Newborn Sleep Program designed especially for infants aged 0-16 weeks. This incredibly robust program includes both videos and a written guide to help you navigate everything related to your newborn. 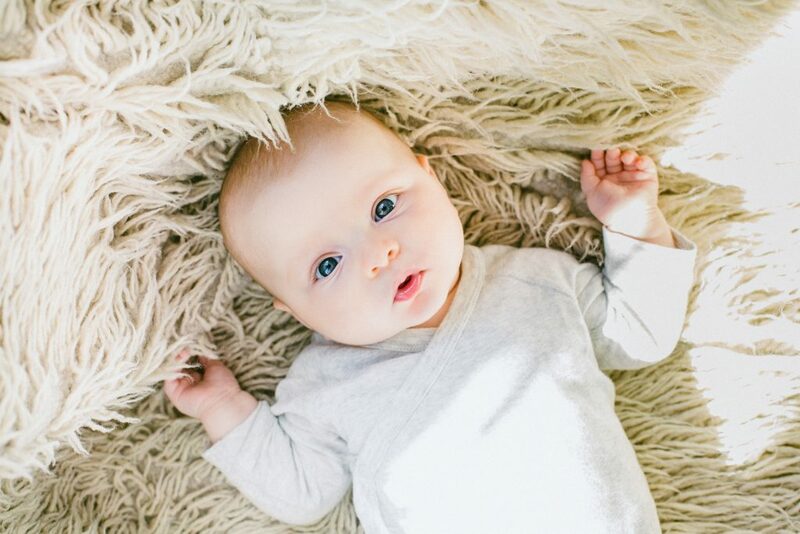 Through this affordable program, you can learn not only how to help your newborn get the best daytime and nighttime sleep as possible (with lots more tips than what I was able to include above), but you’ll also gain guidance on feeding, bedroom environment, crib safety, and more. Use the coupon code NewbornBlog10 at checkout for 10% off The Newborn Sleep Program. Here’s to great sleep and newborn cuddles!! I have a five week old and just came across Your website. We also have a three year old (both boys) and I am really struggling to get our newborn down for naps during the day while also caring for our toddler (who has been a bit more needy since brother was born and is very active/likes to be outside and on the go!). Do you have any articles or advice on how to keep consistency with a newborn when you can always be home to lay them down in a dark room for naps? Also we are trying to do a 7 wake up, 7 go to bed routine, but there are times we aren’t even home by that time at night! Our toddler goes to bed about 8:30 and wakes up at 7:30. Should we move his (baby) schedule back if we can’t always get him down at 7? We have a bit of a more inconsistent life/schedule between my husband and I and his job. We are trying to figure out a rhythm with our baby that is practical but also flexible when we need it during our travels. Thank you! P.S. I bought your book and am about halfway through! Definitely like it so much better than the other baby sleep books! Those all felt super overwhelming and rigid and yours is the first to seem really practical and doable! You and your baby would benefit immensely from the Newborn Sleep Program. Have you checked it out? I think it will answer most of these concerns you’re currently struggling with <3 To answer your question briefly - it doesn’t matter. Do what you need to do to care for your toddler, and if your newborn can’t always sleep in the most ideal environment, just let it be. Doing your best is all that’s required for both of your kiddos to thrive.